Wat Nivet Thammaprawat is a Buddhist temple in the grounds of Bang Pa-In Royal Palace. 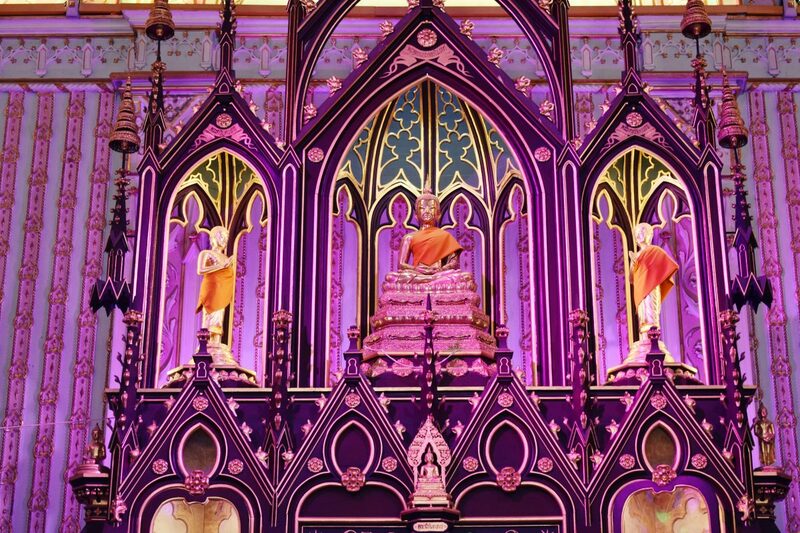 The Wat is a royal temple, first class & was founded in 1878. It is unique as it is the only Buddhist temple in Thailand that looks like a western church. The temple is officially registered as a historic monument. Wat Nivet Thammaprawat isn’t part of the same complex as Bang Pa-In Royal Palace. 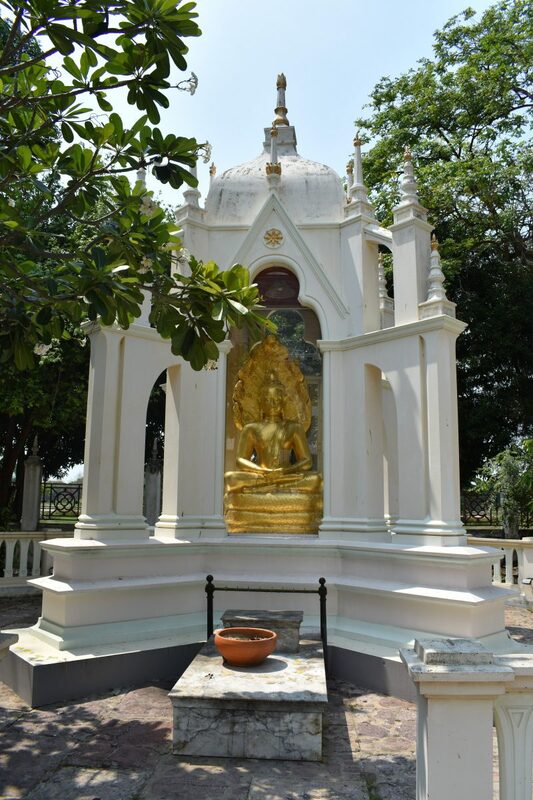 The temple is on Balen Island on the Chao Phraya River directly opposite the palace. There is no direct access from the palace grounds. Access is by an old cable car controlled by a monk that crosses the river from the palace car park. The cable car is free. King Chulalongkorn ordered the construction of Wat Nivet Thammaprawat in 1876 & it was completed in 1878. It was to serve as the Royal Palaces temple. 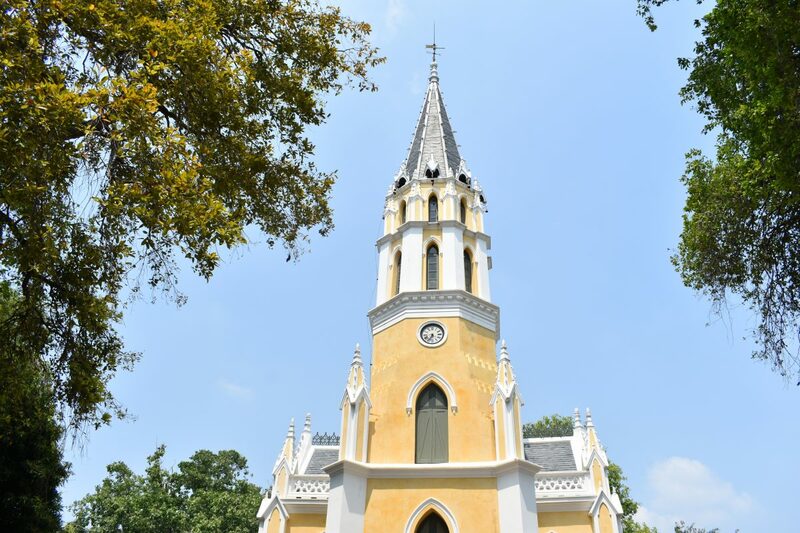 The temple’s design was by an Italian architect, Joachim Grassi who was also the architect responsible for the expansion of the Royal Palace. 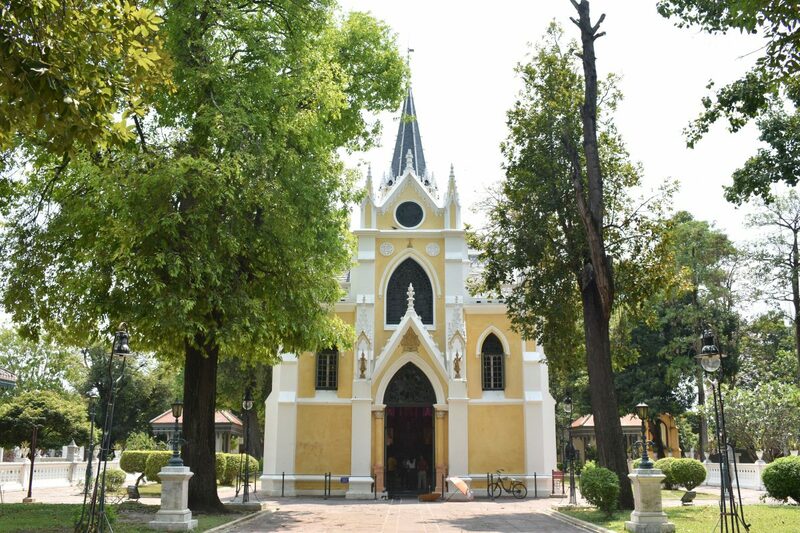 Wat Nivet Thammaprawat features a Gothic Revival style with stained glass windows, a gothic altar, and the main Buddha image in a place that would usually contain a cross in a western church. 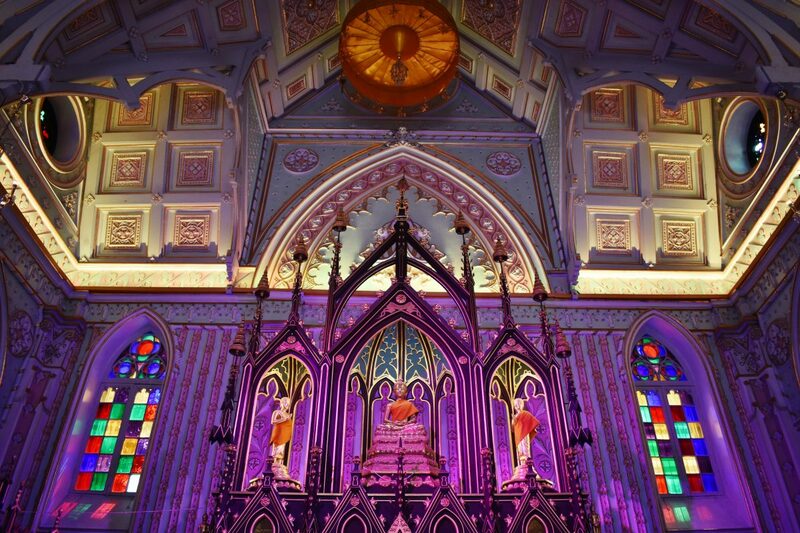 The exterior was designed to look like a Basilica with a central dome topped with a spire. It has all the physical features of a Christian Church. The lower section of the dome features a clock tower & belfry with relics of the Buddha in the upper section. The facade decor is a stucco relief of the great seal emblem & stained glass ornaments. 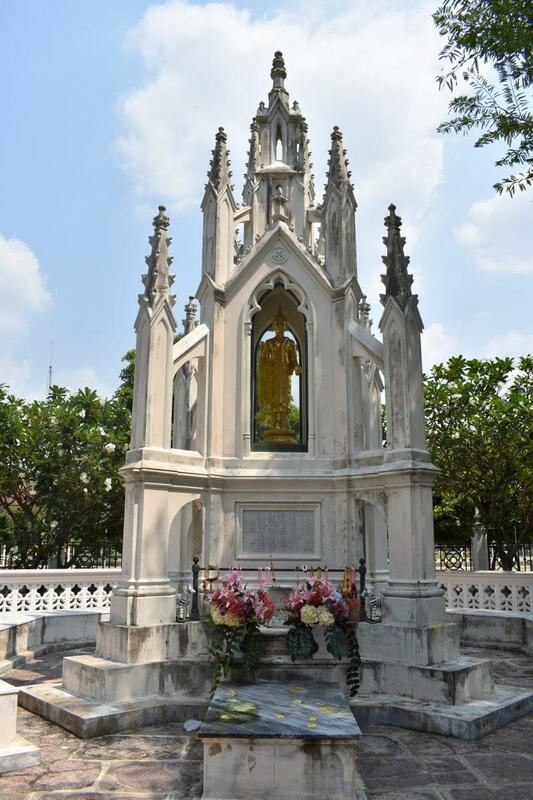 Also, a shrine opposite features two sculptured statues of King Chulalongkorn in the coronation setting. 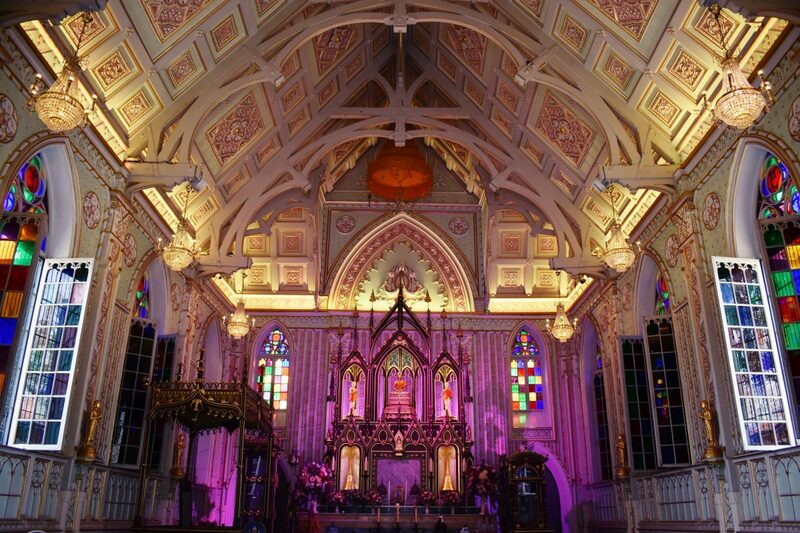 The interior resembles a Christian cathedral with steeply sloped gothic roofs. A stained glass window inside & above the entrance door features the image of King Chulalongkorn. The principal Buddha image is Phra Buddha Phuttha Naruemon Thammopat, seated on a plaster base. The Buddha, flanked by two disciple saints, while underneath the images are two small golden chedis. There are also a couple of small statues of European style medieval knights in armor. To the side is a large The walls of the hall have stained glass windows & more small Buddha images. A stone plaque relates the story of the temple. To the right of the ordination hall is a shrine where the Buddha image, Phra Khanthararat in the posture of requesting rain is kept. Opposite there is another shrine that houses a seated stone Buddha image on a coiled Naga. It is an ancient Buddha image, more than a thousand years old, built during the Lopburi period by a Khmer Craftsman. 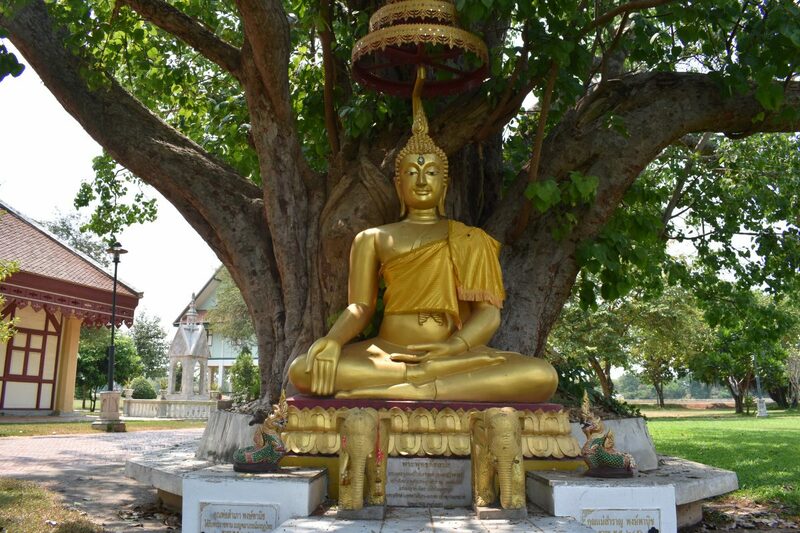 A large Bodhi tree sits in front of the ordination hall with Phra Sri Maha. 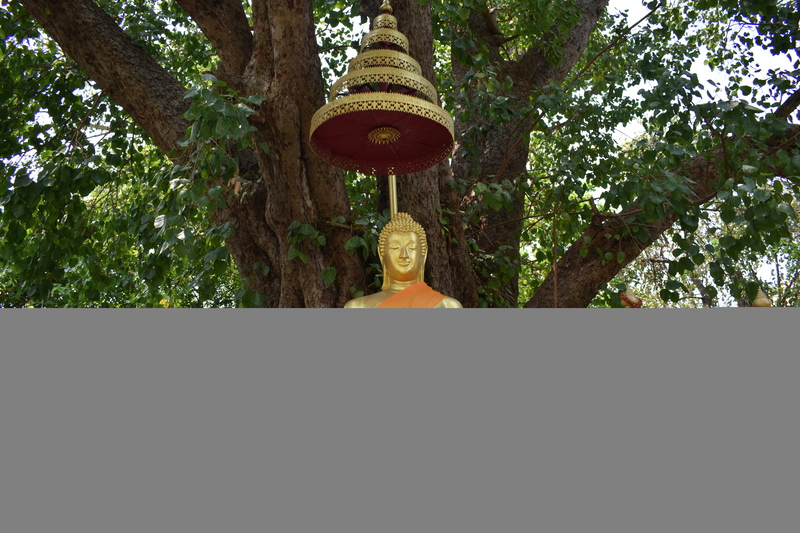 Bodhi tree whose branches shade the area in front of the ordination hall. There is also a stone garden called “Diskul Anusorn”. 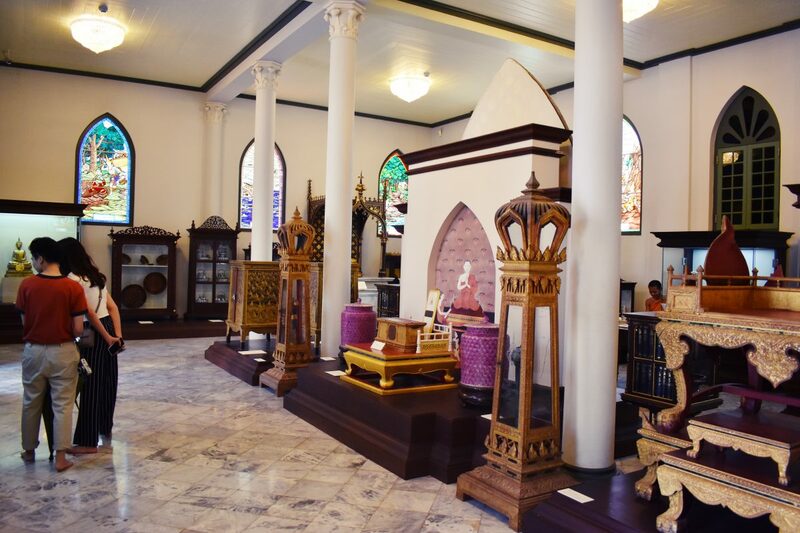 It contains the relics of Prince Damrong Rajanubhab & his family. Outside the main gate of the temple are large grounds featuring more Buddha images and a large building. 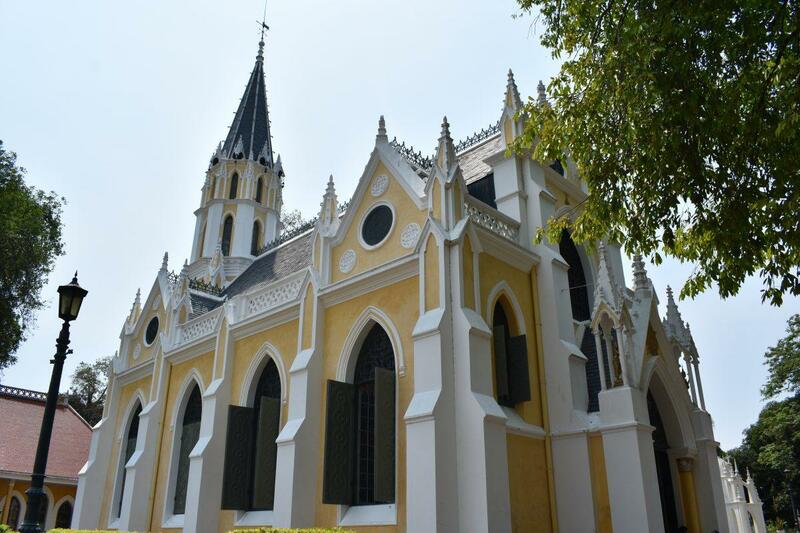 Behind the ordination hall is the old sermon hall which now houses a King Chulalongkorn Museum. 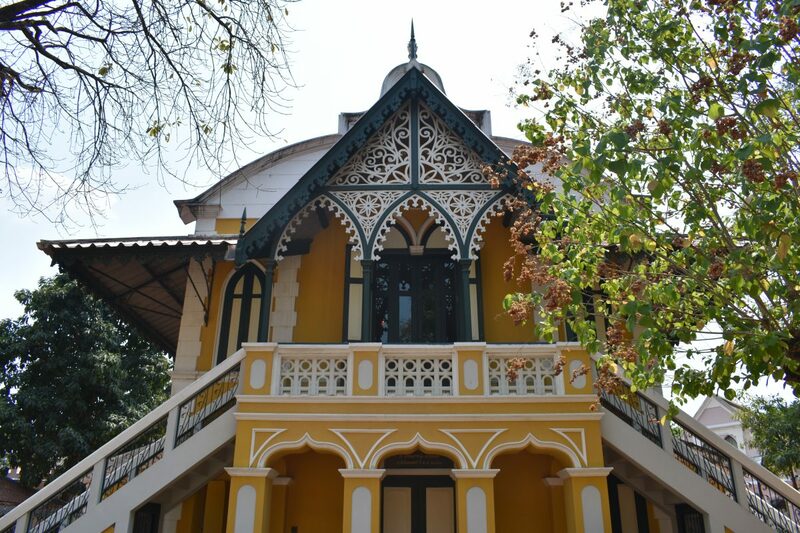 Behind that is a mansion which was once the residence of Prince Damrong Rajanubhab after he was ordained as a monk. Damrong was a son of King Rama IV and was the founder of the modern Thai education system. The top floor of the mansion is open for visitors. There is also a Buddhist scriptures hall containing many rare Buddhist artifacts. At the tip of the island near the cable car is the Balen Island Lighthouse. 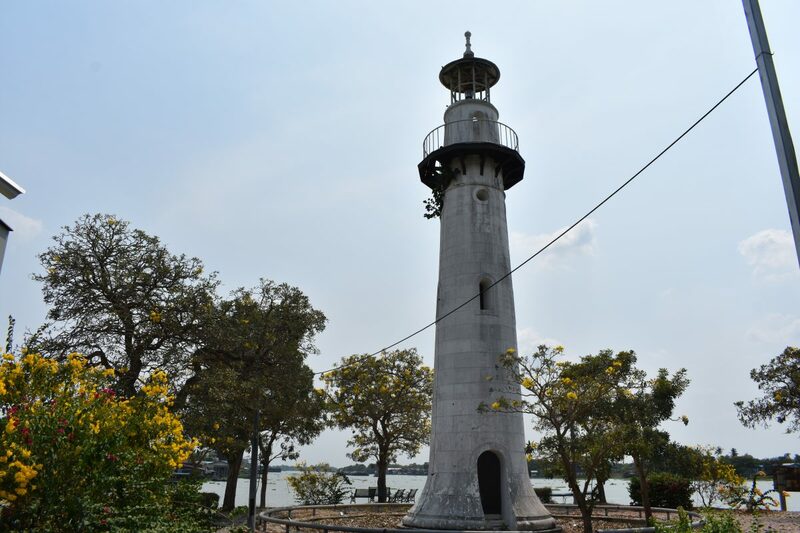 King Chulalongkorn constructed the lighthouse in 1867. The Royal Palace received its supplies by boat and the lighthouse aided safe navigation. The lighthouse is no longer in operation. In Bang Pa-In opposite the Royal Palace.